It has been only a couple days since I opened the Cooking For Engineer's Community Forums, and we're already getting some interesting posts, tips, and recipes. 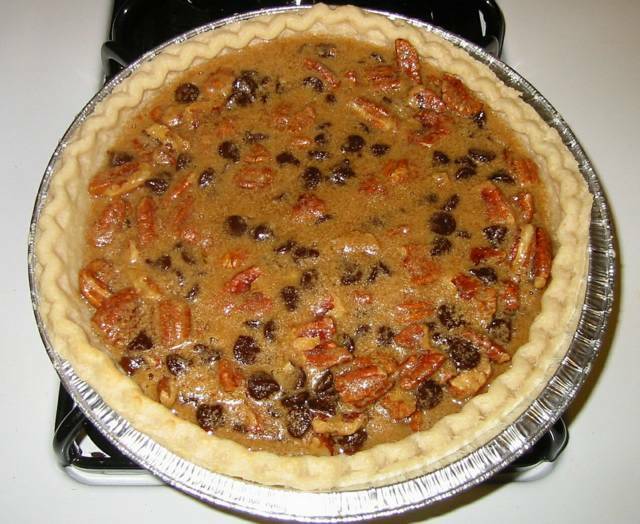 One of the ones that caught my eye was this Chocolate Pecan Pie recipe posted by ScatKat~ (Eric). I thought I'd give it a test and share with everyone the results. Eric's recipe made two to three pies, so the first thing I needed to do was effectively halve the recipe. The new list of ingredients became 4 tablespoons of butter, 1/2 cup dark brown sugar, a large egg, 1/2 cup 100% pure maple syrup, 6 oz. pecans broken up by hand, and 6 oz. semi-sweet chocolate. I decided that since we're interested in testing fillings here, I would take the easy way out and use a store bought frozen pie crust. 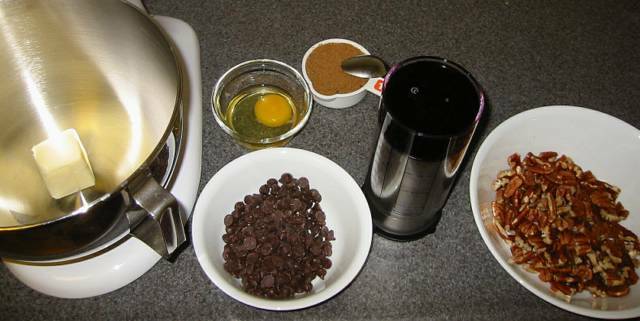 Eric uses Ghirardelli's Double Chocolate chips in his recipe and warns against the use of milk chocolate. (Double Chocolate is Ghirardelli's branding for bittersweet chocolate for baking.) I was picking up the necessary ingredients at my local supermarket (Save Mart) on the way home from work and was surprised to find that they do not carry bittersweet chocolate chips at all. I picked up a bag of Guittard's Semi-Sweet Baking Chips and thus deviated from Eric's recipe a little (or maybe a lot). First, I creamed the butter and brown sugar together. Then I added an egg and mixed until it was fully integrated. I scraped the bowl down once and added maple syrup. 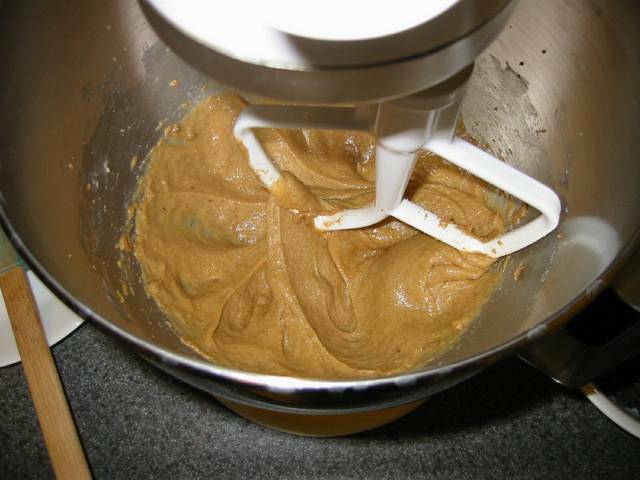 A few more seconds and my Kitchenaid stand mixer had the mixture smooth and consistent. After removing the bowl from the mixer, I poured in the halved pecans and stirred by hand with a spatula. Then I added the chocolate chips and stirred and folded until the pecans and chips were evenly dispersed, about ten strokes. The mixture is then poured into the pie crust and leveled. Normally, I would blind bake the crust to ensure that it doesn't get soggy. (Blind baking is where you bake the crust without filling to harden the crust. This gives the crust more structural support to handle a wet filling so it doesn't fall apart or soak up too much liquid before the filling is baked.) Eric's recipe didn't mention this and called for a fairly high heat of 375°F so I did not blind bake the crust. I then baked the pie in my oven at 375°F until the filling set. I checked the filling by holding the pie on both sides and twisting gently to spin the pie pan. A set filling should not move on the outside and jiggle on the inside (like Jell-O). The pie was done after 45 minutes (just like Eric said). Taste results: The pie is not your traditional pecan pie. This pie is quite chocolatey and less sweet than pecan pies that I've had from bakeries (which I felt was overwhelmingly sweet). I brought the pie into work and it was gone before I knew it with people asking for seconds (but there was none to give out). So, maybe Eric's original recipe of two or three pies would have been better. The general concensus was that the pie was very good and a welcome departure from the traditional pecan pie. The chocolate lover's especially liked the chocolate chips and some commented on the excellent flavor that the maple syrup introduced. I recommend trying this recipe! 4 Tbs. 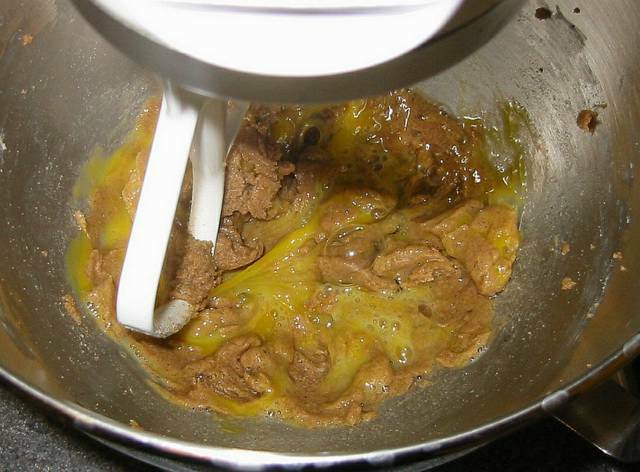 butter cream mix mix stir stir pour & level bake 375°F 45 min. This looks fantastic. 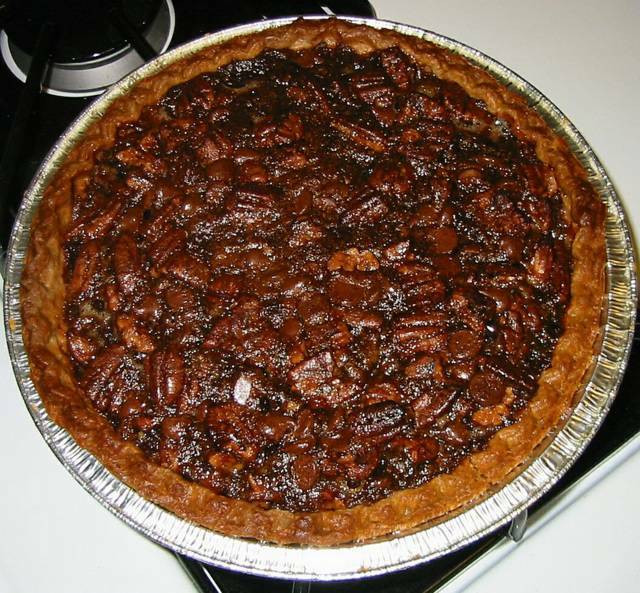 I've never had a Chocolate pecan pie before - I'll have to see if my wife will make this for me. Great blog, by the way. I think that recipes in a blog is a fun format. Hi. I've been returning to your site since I found it on Blooger's Blog of Note. I find the recipe and cooking diagram very ingenious and easy to understand. This blog is really about cooking for engineers! I'm glad that you are really are trying out other people's recipes. Enjoying the blog a great deal. I'm so glad you enjoyed it. I had no idea I was going to be famous though! That pie looks really good (I bet it was heaven still warm with a scoop of ice cream). I've had a similar recipe before but not with the addition of maple syrup. I am wondering what a hit of bourbon would do in place of the syrup? I have some pecans on hand, I might have to try this recipe out soon. I'm a retired Aerospace Engineer that loves to cook. I really like the format but it confused some of my housewife friends so I put it into this form so I could give them the recipe. They ate two of these without saving me a crumb! I love it! Preheat oven to 375º F. Cream 4 Tbs. 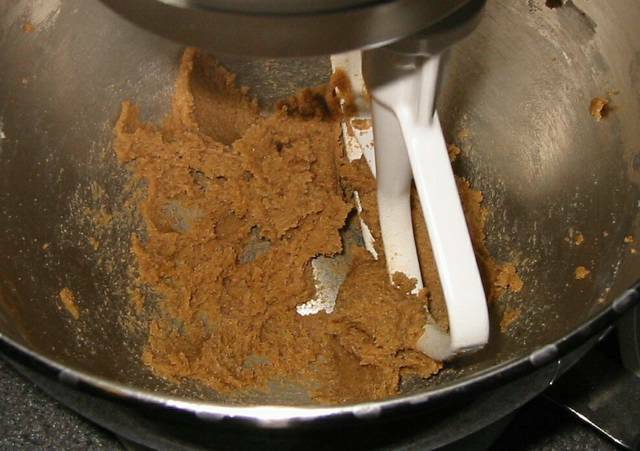 butter, then mix in 1/2 cup dark brown sugar and 1 large egg, Stir in 1/2 cup maple syrup, 6 oz. pecans and 6 oz. 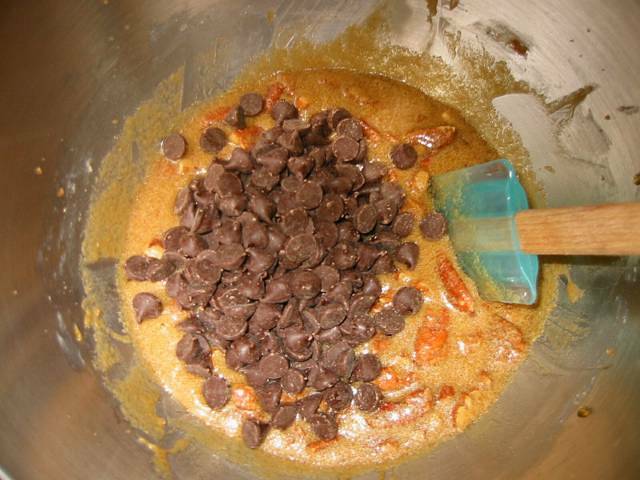 semi-sweet chocolate chips. Pour into 1 9 inch pie crust (Bought or homemade) and level. Bake for 45 minutes, until the sides are set and the middle wiggles a little like Jello. This pie is best fully cooled, if you can wait that long. Well, you should let the first one cool completely so you have a taste test comparison with warmer pies! 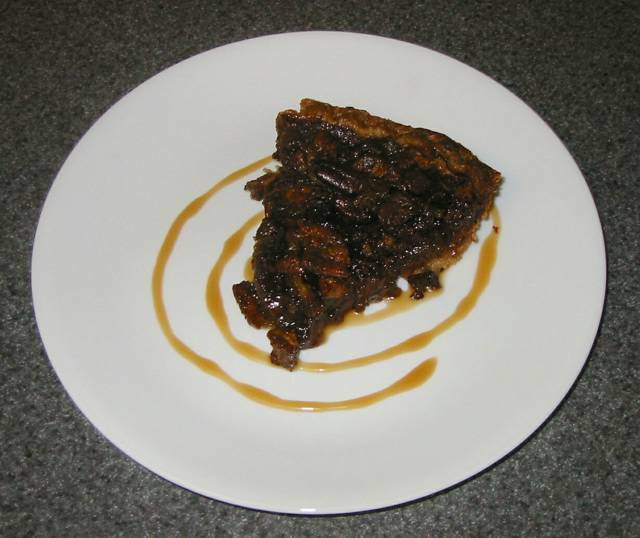 This is not as sweet as you might expect a chocolate pecan pie to be, but I'll bet it disappears all too soon anyway! Since I'm in the South, and have great access to cane Sorghum, I'll have to try one sometime with that in place of the maple syrup. Many think Molasses and cane Sorghum are the same, but they're NOT! Sorghum is made from the Sorghum canes, similar in appearance to sugar canes, and squeezed in a horse or mule driven, homemade squeeze mill. Molasses, on the other hand is a by-product of sugar refining. I like your recipe, but as an engineer, I can't understand why you still use weird mesaures such as tablespoons, cups and ounces. Surely you should use an internationally standard system such as metric? I am quite sure that if you were building a bridge or designing a vehicle or performing any one of the millions of things that engineers do, you would find yourself in deep, deep strife if you started by saying "Take 978 cups of cement, 448 tablespoons of sand, mix with 2000 teaspoons of water .."
So please, be an ENGINEER, not an out-of-date Mrs Beeton. When surfing for a recipe I often come back to this site and am very pleased with the very clear instructions. Some sites are not reviewed for clarity. I love the additional helpful comments and pictures. I thank Angelina for her comments and hope that if folks don't have anything good and enjoyable to add, that they'll just refrain from posting. I am famous for my Chocolate Pecan Pie and somehow lost my recipee. We don't drink so the bourbon one is out - but I have a half gallon of maple syrup in the fridge and we are going to make this right now! It may become our new favorite. Thanks for all the fun food we have enjoyed using your site! I am raising an 12 year old daughter who has already decided to be an engineer, so the fun of teaching her to cook has been a bonus to introducing her to a site organized logically and precisely as an Engineer works. Girls need positive perks in this area - always searching for more. I've made this recipe several times now, and always get rave reviews!!! I personally love the format of your recipes and directions, and though I agree it would be nice to have mL and such, instead of Tbs., I don't own a mL measuring spoon set either, so I guess we are stuck with the English system. I'm a chemist by training and really enjoy the "science" aspect of cooking, (e.g. why egg whites will make good meringue), it'd be cool to add some of this to the site when applicable. I am pretty sure that Michael has covered this in other threads, but I'll give it a go here. Being an engineer is not the same as being a laboratory scientist. Units of measurement need to be chosen carefully depending on where you are and who your audience is. Michael's audience is the home cook, who measures in teaspoons, tablespoons, and fractions of cups. How many cooks do you know with a kitchen full of graduated cylinders, beakers and pipettes? Your civil engineering example is ludicrous, not to mention wrong. In measuring ingredients to build a bridge, most things would be measured in tons (including the cement). This is obviously not an SI unit, but it is used anyways. Demanding that units conform to some sort of standard format, regardless of audience and application is idiotic and pretentious. First, I have to say that the layout of the recipes is fantastic and that's what led me to return to this site again and again. Second - made the pie (several times) and it's a rave. Not only tasty, but easy and reliable (i.e., I don't get a soupy mess that I've gotten in the past with other pecan pie recipes). Tried this on picky eaters and on several people who will eat anything that doesn't move and all have raved about the taste and texture. I learned how to make that pie in 1980 while going to school at Stetson U., Deland, FL. It was called Cajun Pie. I refused to make it since 1982 because it is so good and addictive. I don't need the extra weight. But I am considering making it one more time now that I saw your recipe. P.S. All these whiners complaining about this site and the measurements need to get a life and go away. This is a fun site with good info. Your whining is annoying just as you are. Go away!